Soft Cover, 372 pages, 7.50 x 9.25. Garrett Oliver, America's foremost authority on beer and brewmaster of the acclaimed Brooklyn Brewery, wants to change your food life. In The Brewmaster's Table, he reveals why traditional beer is the new star with today's cuisine and how to make the perfect match. Real beer is now available almost everywhere, yet most people are familiar only with bland mass-market beer. Have you tasted the real thing? Real beer has complex flavors -- it's an affordable luxury that can transform everyday meals from dull to extraordinary. Whether it's a brightly citric Belgian wheat beer with a goat cheese salad, a sharply aromatic pale ale to complement spicy tacos, an earthy German bock beer to match a porcini risotto, a rich, strong Trappist ale with a hanger steak, or even a fruity framboise to accompany a slice of chocolate truffle cake, the right beer is a perfect partner to any dining experience. Garrett Oliver shows you how to make it happen, whether you're at home on Tuesday night, in a restaurant for Sunday brunch, or on vacation in Europe. He explains how beer is made, shows you its fascinating history, and then leads you through the amazing range of flavors displayed by the dozens of distinct styles of beer from around the world. Most important, he shows how beer, which is far more versatile than wine, intensifies flavors when it's appropriately paired with foods to create brilliant matches most people have never imagined. 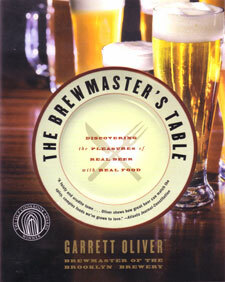 The Brewmaster's Table is entertainingly written by the man Gourmet magazine calls a "passionate epicure and talented alchemist" and is lushly illustrated with Denton Tillman's gorgeous photographs of the world's finest breweries, their excellent beers, and the artisans who produce them. Whether you're a beer aficionado, a passionate cook, or just someone who loves a great dinner, this book will indeed be a revelation. » See more books on beer and food.